There are so many updates at Google Docs, that you'll need many hours to explore them and start to use them. You can now access your browser's contextual menu by pressing Shift while right-clicking. This might be useful if you want to search the text from a document online or to use other features included in your browser. If you don't want to convert a document to PDF and print the generated file, the option to print the document as a web page is back in the File menu. For simple documents, this should be a better option. For better customization, Google Docs lets you define CSS styles for your documents: Edit > Edit CSS. Those who know CSS will find it faster to define styles and use them in the HTML code. The most important limitation is that you can't use images that are not hosted by Google Docs in your CSS rules. This page shows you how to add watermarks, repeating backgrounds, styled headers, image borders using CSS. Presentations can now include videos, obviously only from YouTube, but at least you can find videos directly from Google Presently. "Videos can help you make a point, command the attention of your audience, or even add humor to your presentation," points out Google Docs Blog. 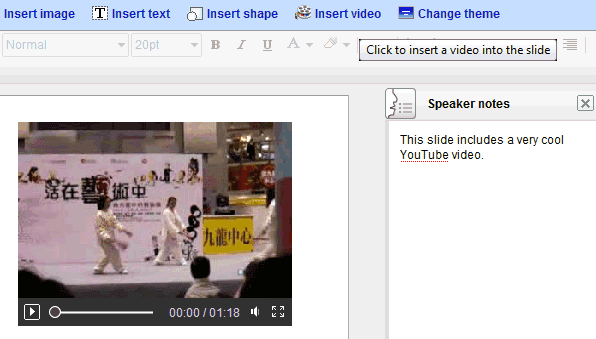 Unfortunately, when you export your presentations as PPT, YouTube videos are replaced with still frames. To write some text that might guide you while presenting, use the new speaker notes feature. "These notes will be visible to you and your viewers in presentation mode or when you print your slides." Google Docs Blog also mentions that everyone who uses the English interface should be able to view and edit documents offline. "When we first announced offline access several weeks ago, it was limited to viewing and editing word processing documents. Now, we've added view-only offline access to spreadsheets and presentations as well." Only youtube videos? That is so M$. Google should know better. It's a shame Google seems hell-bent on turning Google Docs into a mere HTML editor; introducing a CSS editor is indicative of their misplaced priorities. Meanwhile, the rest of the world who use MS Word, Apple Pages or what-have-you rightly ignore Google's confused offering, because it doesn't offer even the most basic functionality. I think adding the option to edit CSS is a great idea. People will add all kinds of code to customize their documents, Google will collect the most interesting ones and add them as options in the interface. This is something I have always wanted. Source level control over documents. Kudos to Google for taking this initiative. A step in the right direction... congrats to google.